Often a picnic is no picnic. It is too often nothing like the comfort and serenity of an outdoor studio as depicted in Édouard Manet’s Le Dejeuner sur L’Herbe. Rather, after schlepping bags and boxes of accoutrement and then propping oneself up awkwardly on elbows that go numb on blankets that steadily grow damp, one discovers bottles that have leaked brine over food, sandwiches that are squashed, corkscrews forgotten. Cling wrap and serviettes blow away; wineglasses topple over; biting and stinging insects invade; and the climax, cold coffee from a flask and someone’s hay-fever attack. Staging a good picnic requires experience, good equipment and considerable planning. Describing something as a picnic is meant to lower expectations; the point of them is one doesn’t have to stand on ceremony. Picnic used to mean a potluck and could even take place in a restaurant. The word is from late 17th century French piquenique, of obscure origins. . In its most elementary form, the picnic is a meal brought along for a pleasurable outdoor excursion. Although there were hunting feasts and people have always taken food with them on jaunts into the countryside, it was really only in the Victorian era that the modern pastime as we know it became popular. In Cape Town favourite spots include Table Mountain, Kirstenbosch botanical gardens, the beaches (especially Clifton), the forests and the rehabilitated city river parks. Picnic has a certain romance about it, a promise of relaxation and lazy love-making. Nadege Cuisine organises French picnics already set up when you arrive at a place of your choice with savoury Provençales madeleines, Gruyère tart, roulés of ham, meli mélo of vegetables, cheese, baguette, cake, wine and decorations. Restaurants blessed with grounds and outdoor surroundings, such as the Roundhouse, Casa Labia, Buitenverwachting and Steenberg offer picnic baskets. Extremely popular are picnics under umbrellas on the lawns at estates in the winelands; on the river banks at Delheim and Solms-Delta; at Spier beside the lake. Picnics are almost an institution at Boschendal. All these are priced at about R290 a couple, and a few, like Hartenberg Estate, even include a bottle of wine. My favourite spot, however, is Vergelegen. Few places can rival this stately farm that dates back to governor Willem Adriaan van der Stel, who took ownership in about 1700. He planted vines, fruit orchards, orange groves, camphor and oak trees until 1706, when he was bust for corruption and shipped back to the Netherlands. In 1917 Lady Florence Phillips with her Randlord husband’s money turned it into the oasis it is today. Vergelegen passed from the ­Phillipses to the Barlows and then to the ­current corporate owners Anglo American in 1987. If you’re out to impress, it is to this manicured estate that you bring your overseas visitors to see the historic homestead and library of precious Africana books, ornamental gardens (a hedge maze is soon to be added), immaculate vineyards and the five giant camphor trees that, at more than 300 years old, are the oldest ­living, officially documented trees on the subcontinent. In the past two years, with great fanfare and hardly an expense spared, Anglo has given the old Vergelegen restaurants a makeover. The new, bistro-style Stables was launched in March 2012, and the ­signature establishment, the Camphors, opened in November under the guidance of celebrated chef Garth Stroebel (as consultant) and chef Peter John “PJ” Vadas. 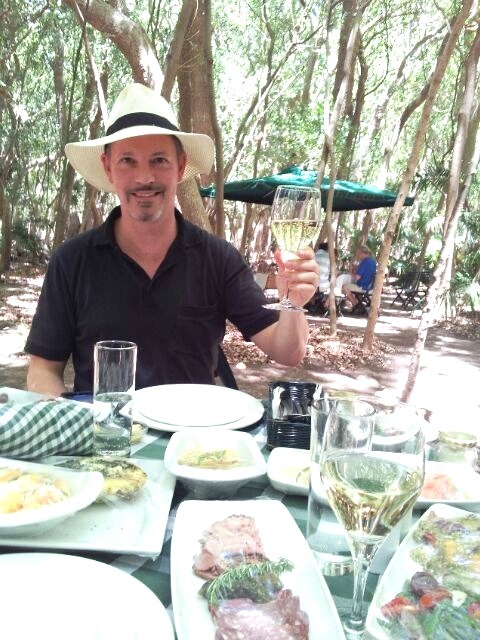 From November to April, one can picnic in the enchanting surroundings of the yellowwood and camphor forest. The camphors are seedlings of the five giants proclaimed national monuments in 1942. I have been to Vergelegen on days when the mercury is well above 30°C, and the drop in temperature as one enters the forest is pronounced. It is also protected against the wind, which has been especially irksome this summer in Cape Town. You enter what is essentially an outdoor restaurant, with classic French bistro, wood-slatted folding chairs and round tables covered in green gingham. This is my idea of a picnic. Tables are placed well away from one another in the forest. In the dappled light with the leaf litter smells, one feels as if one has fallen down the rabbit hole and emerged somewhere magical. The food, crockery, cutlery and wine glasses arrive in a wicker basket. Portions are neatly wrapped to keep out dust and scavenging insects. With the wine opened, there is humus and homemade ­truffle cream cheese to spread on fresh baguette. I had both the vegetarian and the standard menu options. To start, roses of salmon garnished with capers and thin slices of lemon, ­followed by a charcuterie selection of rare roast beef, Italian salami, ­mustard and dill pickles. For the vegetarian there was a fresh spinach quiche, quite eggy but nice, and a large, grilled brown mushroom, which, although the least appealing looking of the fare, was scrumptious with artichoke and sundried tomatoes on the side. There were two fluffy couscous salads, one with petals of red onion accompanied by perfectly cooked, delicate, fine green beans; another with cubes of butternut. The coronation chicken (an invention of two female British Cordon Bleu chefs) is creamy, curried breast meat with ample slivers of toasted, blanched almonds. For dessert, served in a jar, yoghurt panna cotta, light and creamy and not too sweet, with berries lending tartness for depth. The meal finished with a selection of local cheeses served on vine leaves with savoury biscuits. At 3pm the cicadas started their shrill droning and coffee arrived; lukewarm, a little tired, probably from an urn somewhere. They should keep it that way as at least one reminder of your average picnic. After such a magical refection, it’s churlish to complain. To arrange a picnic with Nadege Cuisine, email: nadege@nadegecuisine.com. This article first appeared in the Mail & Guardian 22 February 2013.